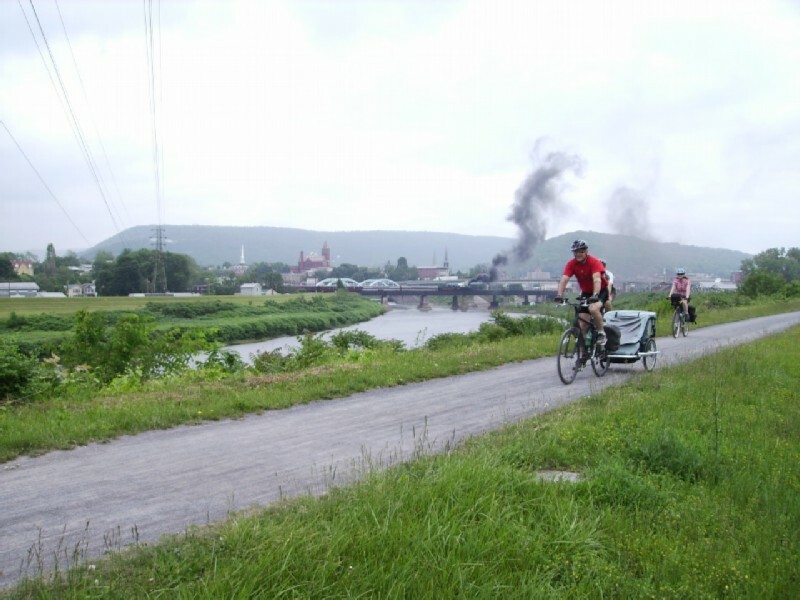 After walking our bikes the 1/4 mile on the edge of the railroad right-of-way (not the tracks of course) to the Sandcastle parking lot just beyond the bridge, we met a shuttle provided by Yough River Transport that we had prearranged. The shuttle took us through the parking lot and a street through a new shopping center before continuing on PA 837 until crossing the Monongahela into McKeesport. The shuttle left us here and we soon found the trail. I observed that we could just as well ridden the entire portion. The whole route seemed to either be bike lanes or sidewalks for the faint of heart. We enjoyed lunch at the Picnic Place, an snack bar right along side the trail in West Newton. As we were approaching the 50 mile mark, everyone was getting tired; and I thought I might have to call a SAG wagon (cab) for Jeanine. But we soon entered Connellsville; but we still had 1.5-2 miles to reach our motel. We passed a supermarket and decided to purchase food for a picnic at the motel, rather than finding a restaurant. The motel, even though it was located in Walmart Country, turned out to be very nice; and it had tree covered picnic tables that hit the spot. 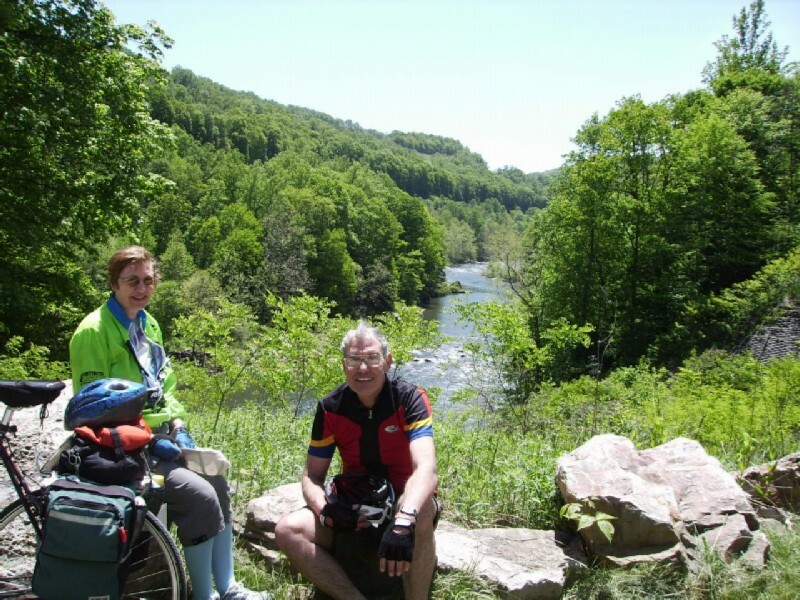 Today we would be riding what most would consider the most scenic part of the ride, through Ohiopyle State Park. After a good night's sleep, or part of one anyway, we arrived about a half hour late in Pittsburgh- a good thing since the scheduled arrival was 5:15 AM. The bikes which traveled in the baggage car on the Capital Limited, arrived in good shape; but I needed more time than usual to reassemble and adjust my old Schwinn touring bike. Resting along the GAP. Youghiogheny River in the background. 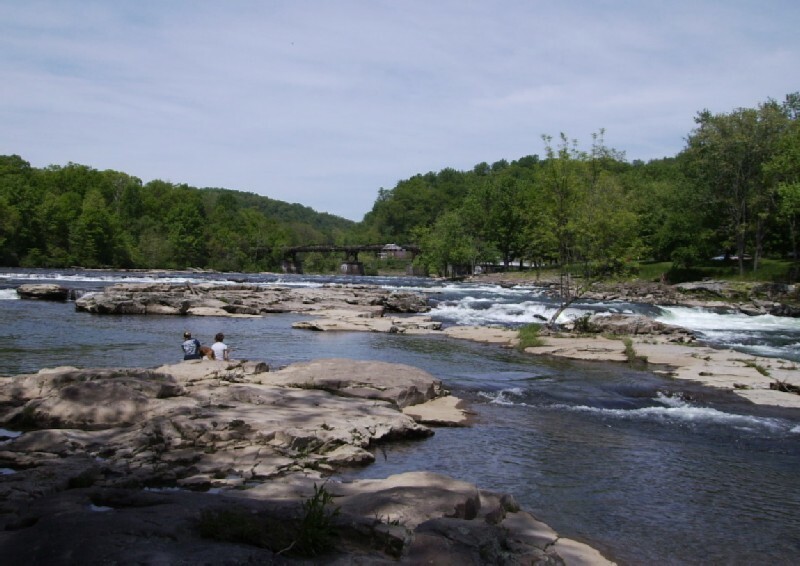 The Youghiogheny rapids at Ohiopyle State Park. The Ferncliff High Bridge is in the background. On the High Bridge. It is referred to as "high" because the trail first crosses the river on a "low" bridge; but then the river makes a U turn and drops considerably in elevation. The trail then recrosses the river high above. it. 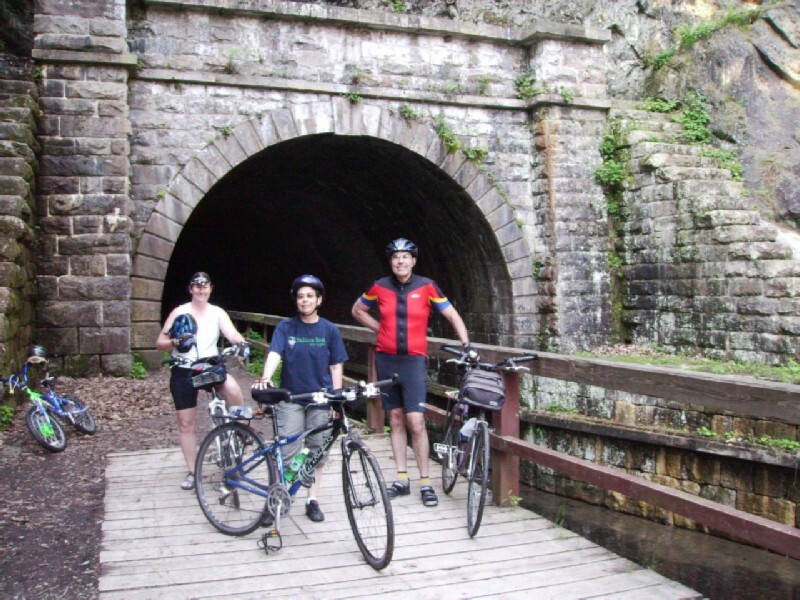 After descending from the continental divide and passing through the Borden tunnel we reached the Frostburg trailhead. 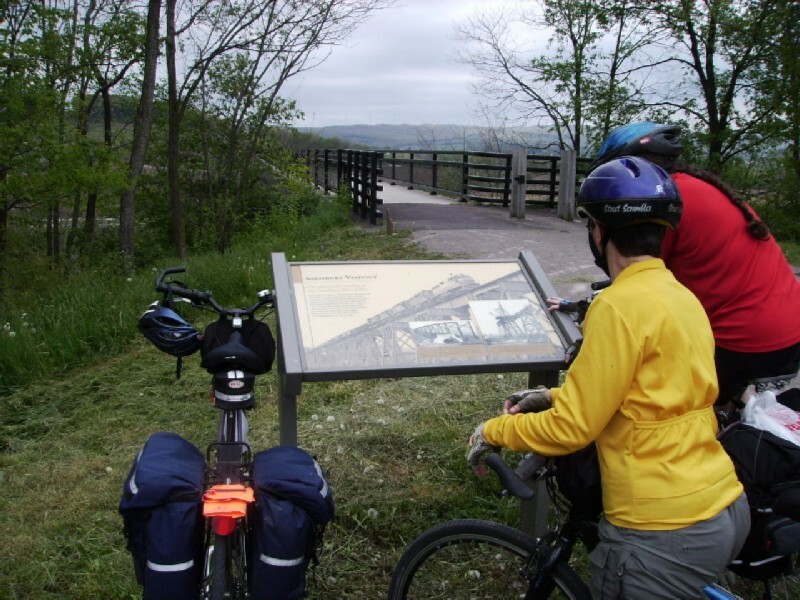 The trail had not yet been completed into Cumberland; so we we took the bike path up a steep steep hill into town and US 40 which would take us into Cumberland. Also we wanted to have lunch in Frostburg and visit the Western Maryland Scenic Railroad station. From the eastern edge of town, an exhilarating 6 mile long downhill ride on US 40 took us to the Super 8 in La Vale. Fortunately, there was a wide bicycle lane (shoulder). Although La Vale functions primarily as an exit of I68, it was slightly more user friendly than the typical asphalt jungle at interstate exits. One of the nice things about the GAP/C&O, now that the Frostburg - Cumberland section is completed, is that you can go the whole distance while avoiding the typical sprawl-land. 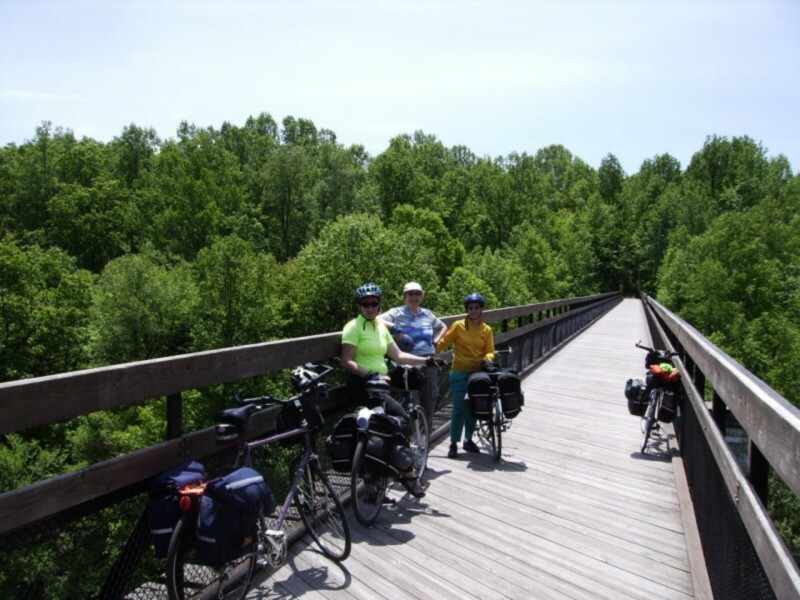 Day 5: La Vale, MD to Paw Paw, WV; MILEAGE 34; Lodging Heritage Trail Bed & Breakfast. Rather than continue on US 40 through the Cumberland Narrows, we took Bradock Road, which changes to Greene Street, into Cumberland. Not much traffic; but one slight up hill. We met Gary and Lynn, who had driven from WV, at the restored Western Maryland station. It houses the National Park Service information office and museum and the Western Maryland Scenic Railroad ticket office. 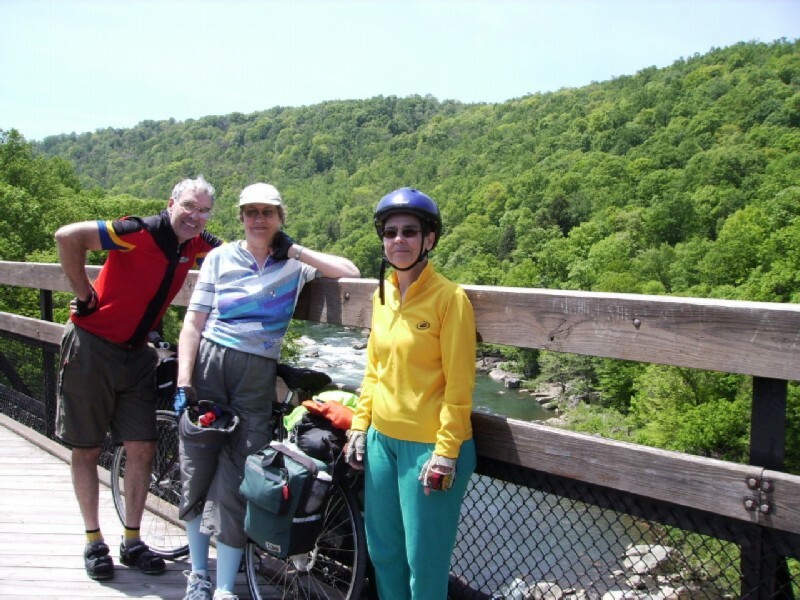 Lynn was not able to ride the entire way on the long days from here to DC; so she switched off with Jeanine, both riding part way each day and driving the SAG wagon the rest of the time. This was fortuitous because Jeanine would also have difficulty with the long days between here and DC. 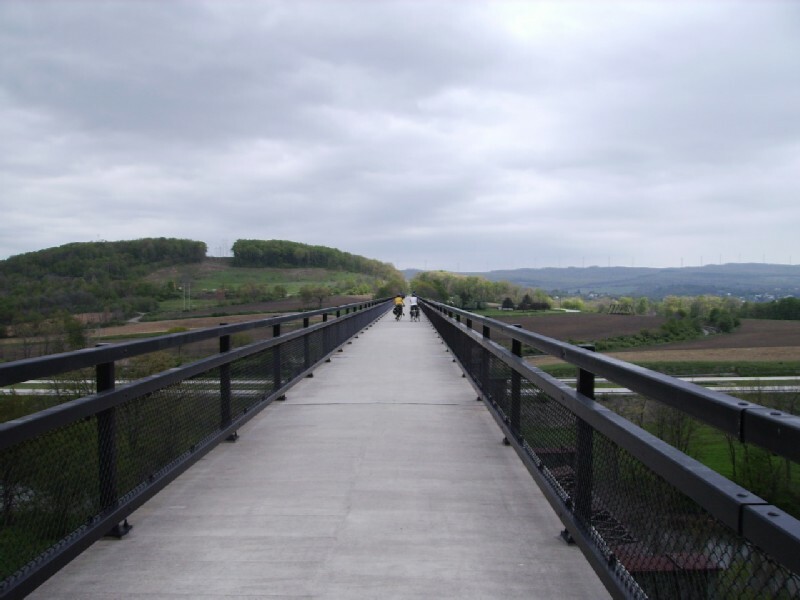 Another view from the High Bridge. We stopped for lunch at the restored RR station in the scenic village completely surrounded by the Ohiopyle State Park. While we were there, a large group of girls on an outing from an Orthodox Jewish school in Pittsburgh were getting fitted out with rental bikes. Their general decorum was amazing, no squeeling and schreeking that you would expect from a group their age. They did present quite a sight biking in long skirted dresses. We enjoyed supper at Sister's Cafe in downtown Confluence. Day 3: Confluence to Meyersdale: MILEAGE 32: LODGING Yoder Motel. The B & B proprietor had difficulty getting breakfast for some reason; and we were a little late getting on the road. This wasn't a bad thing because at the time we would have normally left, it was raining. By the time we got underway, we were able to jettison our rain wear. If I were to do it again, I would negotiate a no-breakfast rate. Approaching the Salisbury Viaduct from the west. The Salisbury Viaduct crosses the Castleman River, CSX railroad, and a four lane highway. The trail enters Meyersdale on a ledge north of town. The restored Western Maryland Railroad Station houses a museum, gift shop, model train display, and trail information. It was open when we were there on a week day. However, its website says that it is open weekends from May through October from 1 to 5 p.m. and by appointment. The main street that takes you into downtown crosses the trail at the trailhead. The Yoder Motel seemed to be a cross between a mom & pop motel and a B&B. At first we wondered about possible noise from a small motel and ice cream drive in directly across the street because it seemed to be a Harley hang out. But the ice cream shop closed early enough that it did not disturb us. 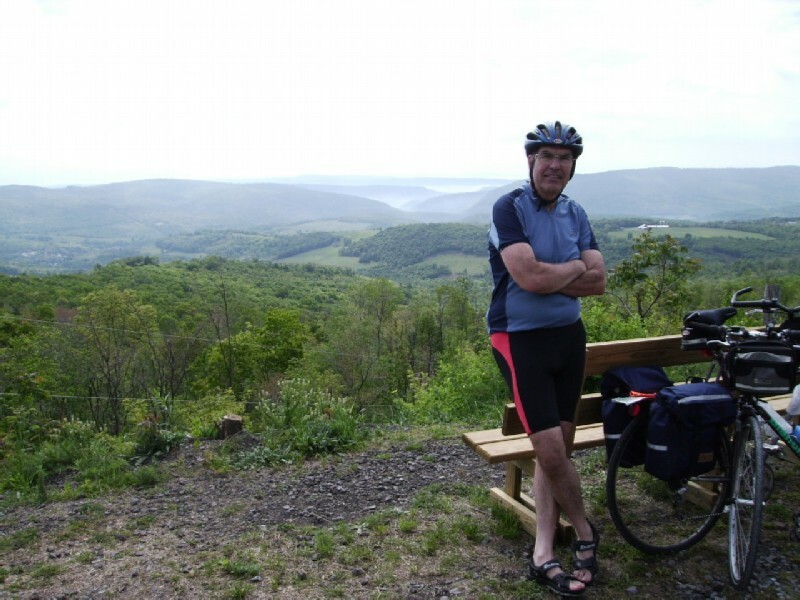 Day 4: Meyersdale to La Vale: MILEAGE 28; LODGING Super 8. West Portal of the Big Savage Tunnel. 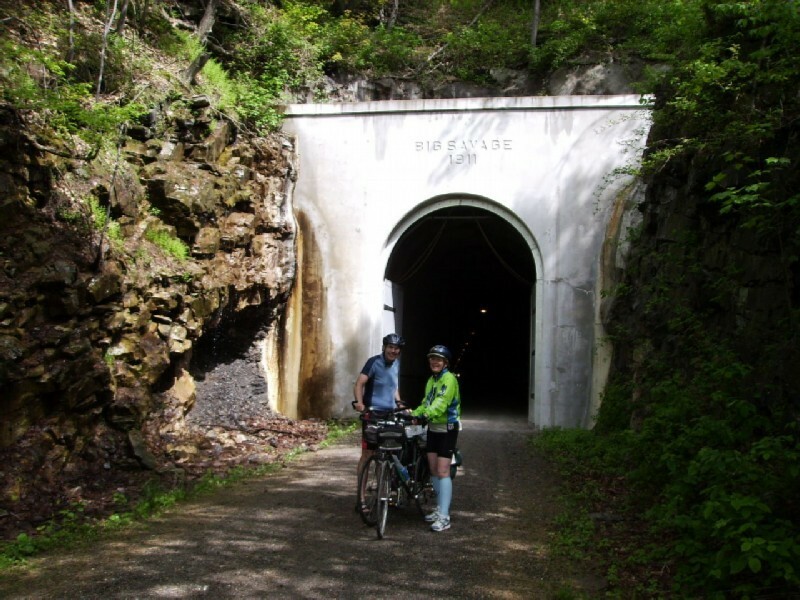 The 3,294.6 feet long tunnel lies 2 miles east of the eastern continental divide at Deal, PA.. It turned out that we were the first official riders through the tunnel after a major construction effort. Grand opening ceremonies were held later that day. We had been going uphill almost imperceptibly from Pittsburgh to the continental divide just west of the Big Savage Tunnel. When we emerged from the east portal, the gain in altitude became visible. The Cumberland Narrows and Potomac River valley are in the background. 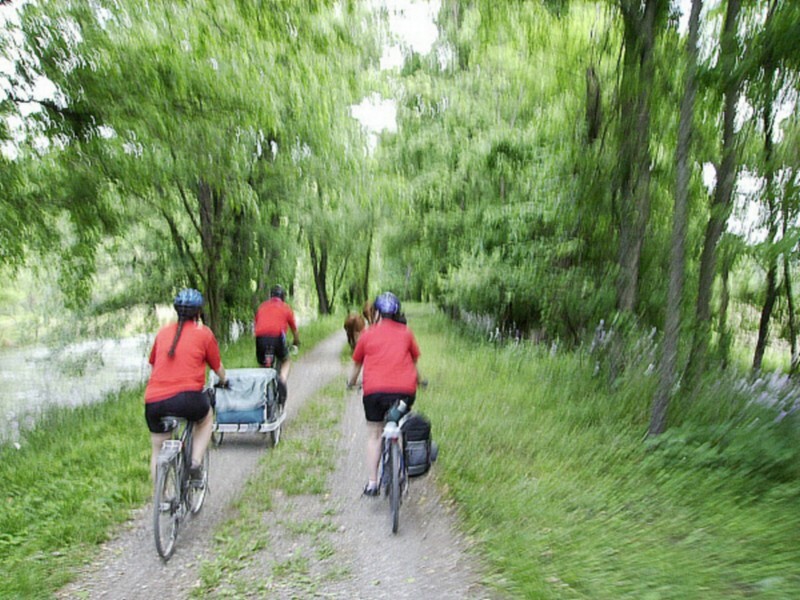 Departing Cumberland, MD on the C&O Canal towpath. A Western Maryland Scenic Railroad train pulled by a steam engine is also departing Cumberland. Lock tender's house at Oldtown, MD. Can you spot the odd ball? We had lunch at the Schoolhouse Kitchen in Oldtown. It was housed in a former elementary school building, along with an antique auto restoration business. To find it, turn left into town for about 0.2 miles and then turn right for another 0.2 miles. Slowing down for cattle on the trail west of Paw Paw. That is Gary pulling the trailer; he wanted to camp some of the time. He later said the narrow track was not suited to a trailer. The B & B's accommodations were fine; although management was nowhere to be found. I believe someone had just purchased it and was trying to figure out how to run it. We had supper at the Sweet Magnolia Family Restaurant, a block or so from the B&B. Breakfast was provided at Grandma's Country Kitchen and Inn, another B &B next door. Emerging from the Paw Paw Tunnel just east of Paw Paw, WV. 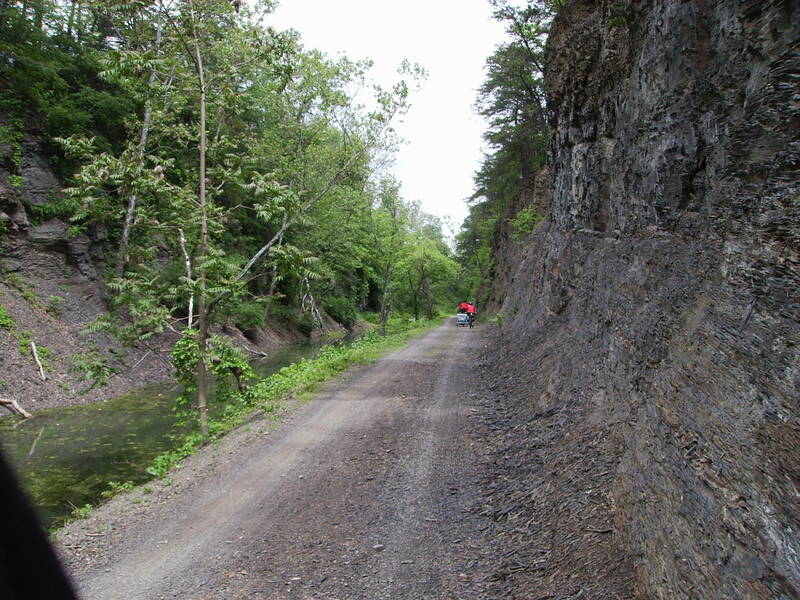 A rock cut just east of the Paw Paw Tunnel. NOTE: at this point the camera battery died and we had forgotten the charger. We made the obligatory stop at Bill's Place in Little Orleans for coffee only, since it was too early for lunch. I was glad to see that it had been rebuilt after a fire a few year's ago. We were met there by Lynn, who had had difficulty finding it among the back roads in the area. 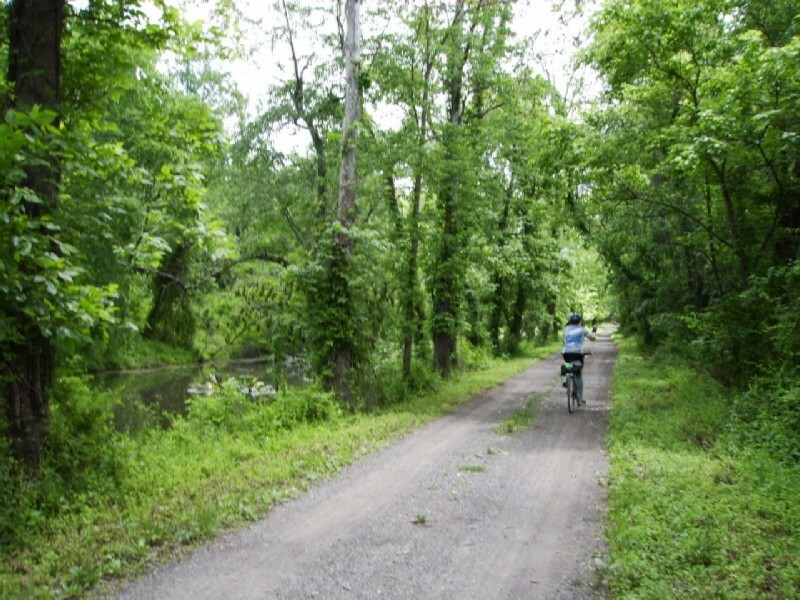 Although the trail condition was not bad, we were happy to move over to the asphalt Western Maryland Rail Trail. The western trailhead is to the left of the canal trail at Pierre (whatever that is!). We exited the trail for a few blocks in Hancock to have lunch at Weaver's Restaurant & Bakery, a very popular spot. Near the eastern end of the WMRT, we elected to ignore the sign pointing us back to the canal. Shortly afterwards we found ourselves at the trailhead parking lot; and our only option, other than backtracking, was to follow US 40 for a mile or so until the entrance to Fort Frederick State Park. Here we made our way through a big reenactment event back to the canal. The Red Roof was located on US 11, the main thoroughfare, about a mile from the canal. Today was the road detour around Big Slackwater, an area where the tow path has been permanently washed out. The route of rolling hills and mcMansions added only about 0.7 miles to the trip. It was Memorial Day weekend and we could hear the redneck rendezvous going on in the campground across the river before the Shephardstown bridge. I wouldn't want to have camped along the trail in this area. As we approached Harpers Ferry after about 40 miles. we were hot and tired. So we locked out bikes at the base of the railroad bridge across the Patomac into Harpers Ferry. Then we walked on the sidewalk along side the tracks over the bridge into Harpers Ferry to a restaurant overlooking the valley (I forgot the name). Service was slow (it was Memorial Day weekend); but it was amaziing how a beer revived us for the last few miles into Brunswick. The Green Country Inn, on the edge of Brunswick about 2 miles from the trail, seemed to be the home away from home for CSX Railroad employees. Brunswick must be a division point; and there is fair size railroad yard there (several years earlier, I had camped along the trail and could hear the banging and clanging of freight trains being put together all night). The motel seemed fairly modern; but was not the best. However it did have a decent restaurant that stayed open all night for the benefit of the RR workers, I suppose.